Federal Circuit Reverses Dismissal in Hall v. Bed Bath & Beyond, Inc. The Federal Circuit reversed the district court’s sua sponte dismissal of a complaint filed by Mr. Robert J. Hall for patent infringement and other claims. The Federal Circuit opinion can be found here. 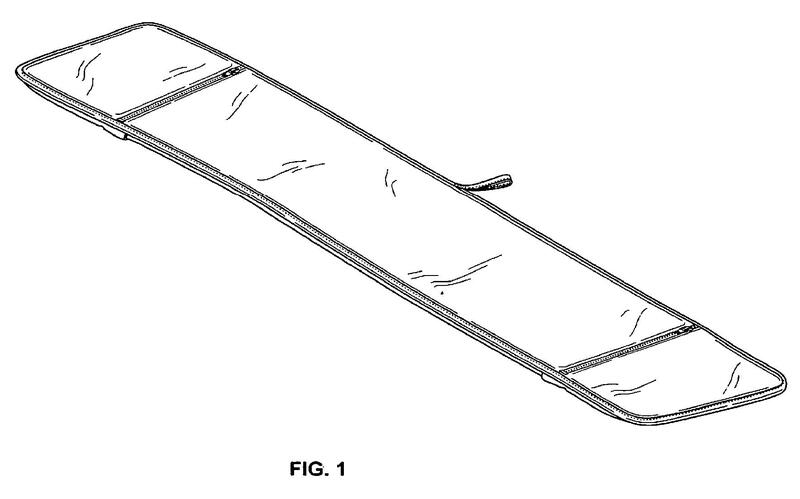 Mr. Hall accused Bed Bath & Beyond of infringing U.S. Design Patent No. D596,439 entitled “Towel Tote.” Fig. 1 from D596,439 is reproduced below. Mr. Hall’s complaint identified the patent, showed the patented design, and described the accused towel. However, the district court took the position that the complaint should have included answers to question such as: “what is it about Plaintiff’s towel that he claims is ‘new, original and ornamental,’ meriting the protection of a design patent?” Opinion at 5. The district court dismissed the complaint for failure to state a claim on which relief can be granted. In vacating the district court’s dismissal, the Federal Circuit noted that there are five necessary elements of a patent infringement pleading. These required elements include: (i) alleging ownership of the patent, (ii) naming each defendant, (iii) citing the patent that is allegedly infringed, (iv) stating the means by which the defendant allegedly infringes, and (v) pointing to the sections of the patent law invoked. Opinion at 4. The Federal Circuit pointed out that Mr. Hall presented a lengthy complaint and plausibly satisfied each of these requirements. Opinion at 6-8. The Federal Circuit found that the district court erred in requiring that the complaint identify the “new, original, and ornamental” aspects of the claimed design, and pointed out that in Egyptian Goddess the Federal Circuit eliminated the “point of novelty” step when determining infringement of a design patent. Opinion at 7. Further, the Federal Circuit stated that “claim construction is not an essential element of a patent infringement complaint.” Opinion at 5. Judge Lourie wrote a dissenting opinion. Despite pointing out flaws in the district court’s analysis, Judge Lourie’s dissent took the position that the district court’s analysis was not sufficiently faulty to justify vacation of its dismissal and that the plaintiff should have accepted the court’s invitation to replead its patent count. Dissent at 3.